A report recently released by the Pittsburg State University’s Kelce College of Business shows significant economic growth in Pittsburg, Kansas. 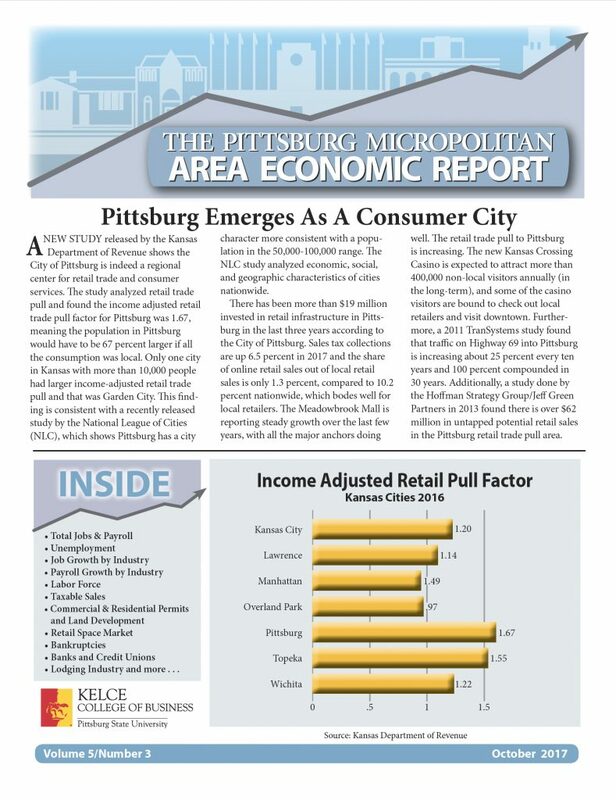 The Pittsburg Micropolitan Area Economic Report, published this month, demonstrates positive economic trends in the areas of retail sales, job growth, the local housing market, hotel revenue, cost of living factors and more. “There seems to be a general optimism setting in locally, and these recent economic trends bode well for the Pittsburg Micropolitan Area,” said Michael Davidsson, an assistant professor and economic researcher in Pittsburg State University’s Kelce College of Business. Davidsson has written and produced the quarterly report – a broad overview of every sector of our regional economy – since 2014 when he began studying the local and regional economy. Even then, he saw signs of progress as well as potential. That progress and potential hasn’t waned. Last year, there were 79 new, active local small businesses. In the past few years, nearly $288 million has been invested in the local community through new local business and expansions, construction at PSU, and most recently, Block22. The report highlights Pittsburg as a regional hub for retail trade and consumer services. According to a study by the Kansas Department of Revenue, the income adjusted retail trade pull factor for Pittsburg is at 1.67 – the second largest in the State next to Garden City. With more than $19 million invested in retail infrastructure in the last three years and sales tax collections up 6.5 percent in 2017, the Pittsburg economic outlook is overwhelmingly positive for local retailers. According to Davidsson’s report, home sales in Pittsburg have seen a dramatic increase, with 320 homes being sold in the Pittsburg area – 14.7 percent higher than the same period in 2016. Houses in Pittsburg are also selling more quickly, with the average home staying on the market 145 days (down 11 days), and the median home on the market for 89 days (down 10 days). Job growth for the area has increased 2.1 percent (up 346 jobs from the first quarter in 2016), resulting in 17,150 jobs. The number of people unemployed in the Pittsburg Micropolitan Area continues to decline, with unemployment at 5.0 percent, compared to 5.7 percent in July 2016. For Pittsburg City Manager Daron Hall, seeing these positive results is a gratifying experience. Today, Davidsson’s report is distributed to more than 850 area businesses and features the latest facts and figures regarding economic, property and employment trends in the region. The purpose, he says, is to help business leaders make more informed decisions about their future, and to help the city make more informed decisions about investments.